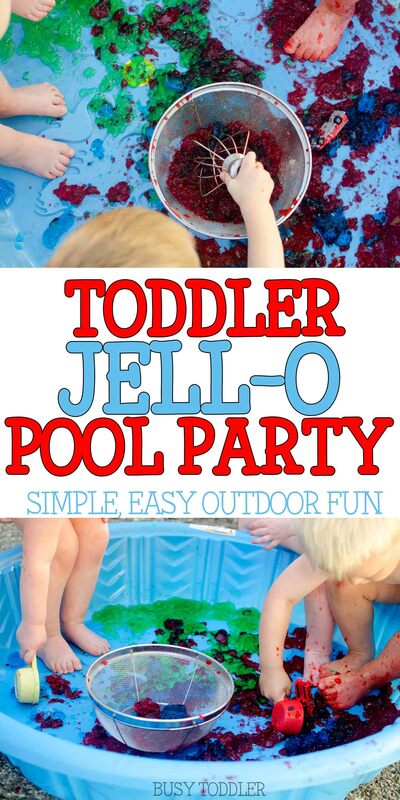 Host a Jell-o Pool Party for an easy toddler play date. 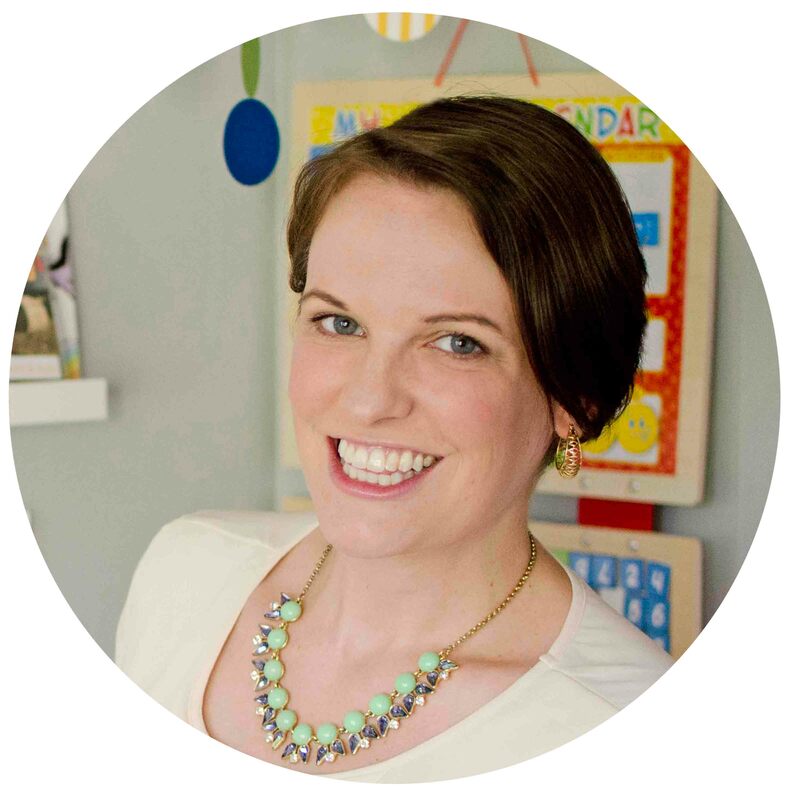 Need to host a really sophisticated toddler event at your house? Something super high class that the kids will be talking about for ages? Look no further than a Jell-O Pool Party. Ok so maybe this isn’t the kind of high brow event Prince George would host but it worked just fine for my little Prince and all his friends. 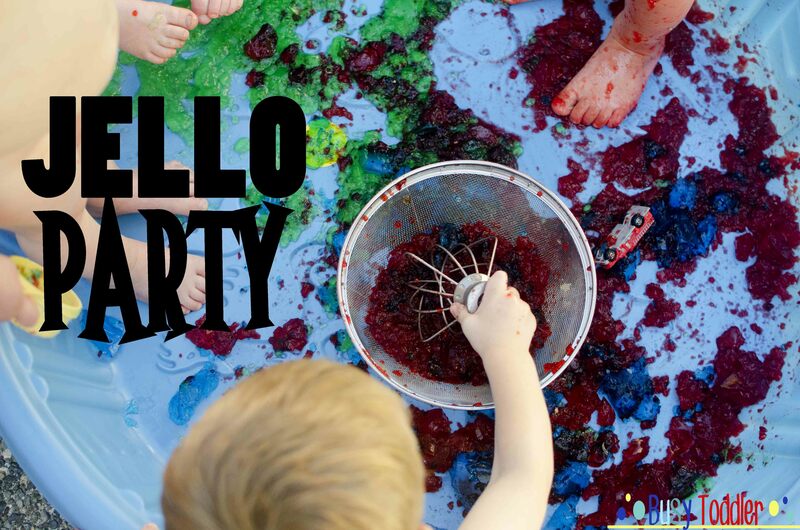 We had 4 two year olds over for a messy, sticky Jell-O Pool Party and it was rager for sure (wink). 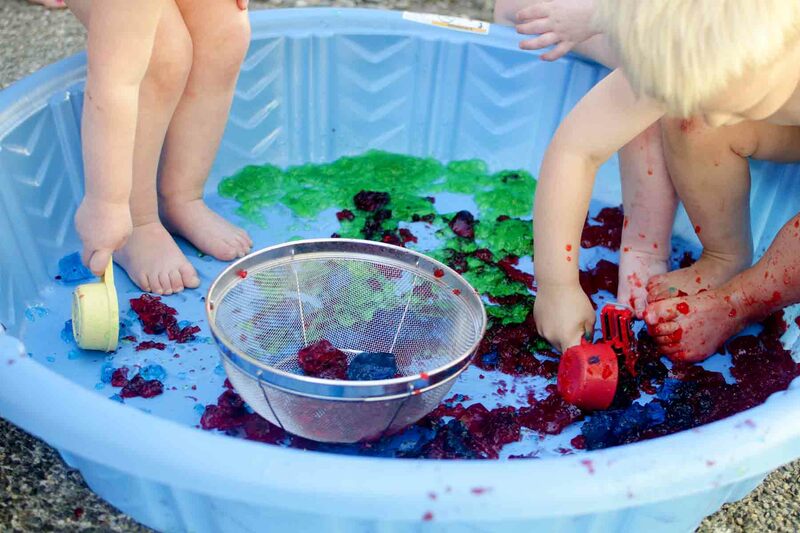 Setting up a Jell-O Pool Party is so easy! 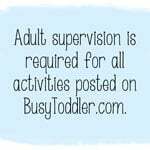 For this activity, we made three batches of Jell-O for the four toddlers to play with. That actually seemed to be the perfect amount for 4 toddlers to “share”. 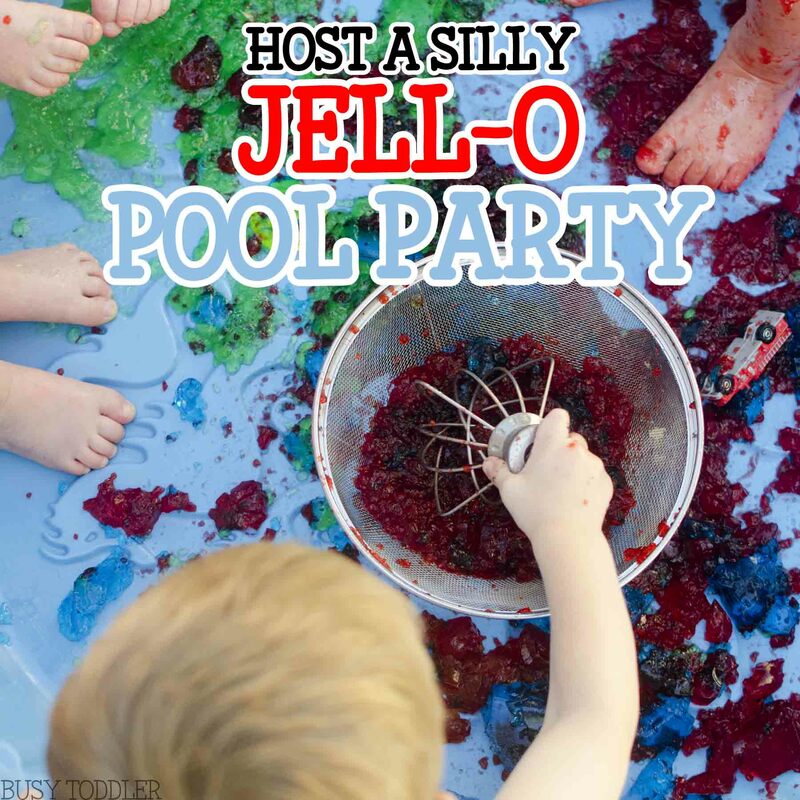 You will want to make your Jell-O the night before, let it set, then dump it into your pool the next day. We added in trucks and kitchen utensils for fun. It was definitely a naked party because Jell-O always stains (at least it does for me, but I’m not exactly a laundry whiz). The kids loved being able to run around the backyard, in and out of the Jell-O pool with each other. I love giving toddler’s chances like this to really get messy. And since it was a backyard activity in the summer, the mess stayed outside and contained. My white couches can live to see another day! The hit of the party (aside from the Jell-O) was the kitchen colander. I would highly recommend adding one to your Jell-O Party list. The kids loved working the Jell-o through it, pushing it, and using it to mix. Clean up was actually a breeze for this because we set up a sprinkler on the other side of the backyard so the sticky bodies could run through and rinse off before even stepping food back in my house. The Jell-o rinsed out of the pool easy peasy and everyone was happy as a clam. You should totally try this at your house! Hosting this Jell-OPool Party was the highlight of the summer activities. 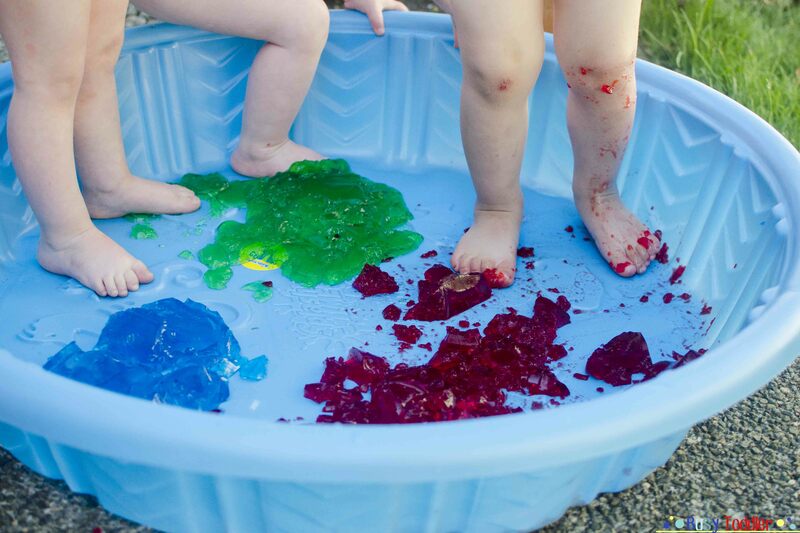 The kids still talk about the day we made the Jell-O pool. 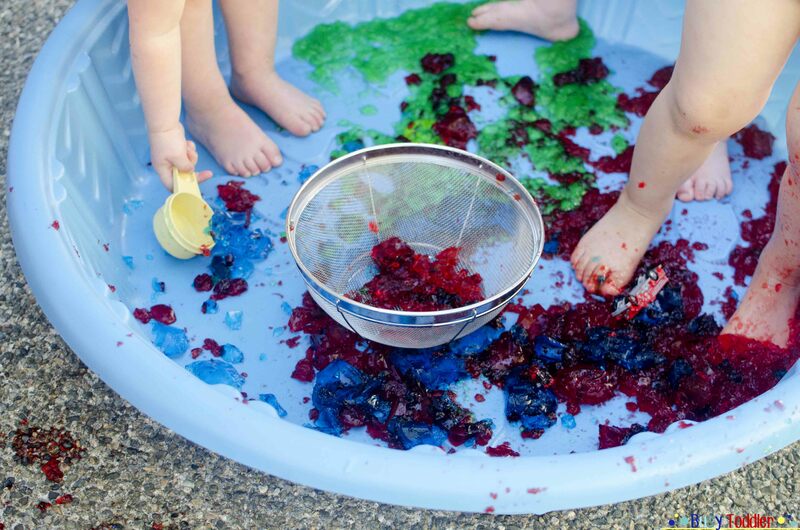 There’s always room for Jell-O, especially in summertime toddler activities. Need more Jell-o ideas? Check out my Messy Boats, Jell-O Dig, and ABC Jell-O.